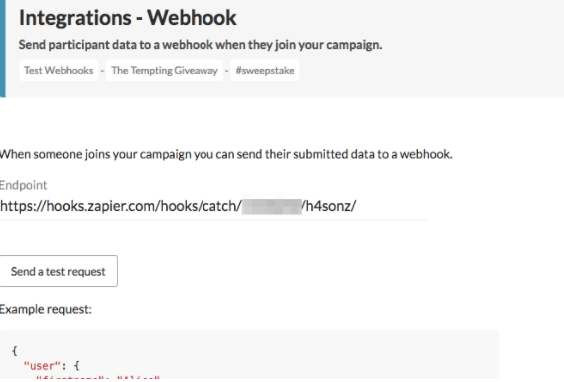 Your Viral Loops campaign has a Webhook integration that fires a webhook when a participant joins your campaign. Here’s how to use it to send to any of your favorite services the participant data captured when they signed-up to your campaign (eg. name, email etc). You need to have an account on Zapier but please note that some actions are only available on a paid plan. We will now create a Zap to email us when someone joins our campaign. 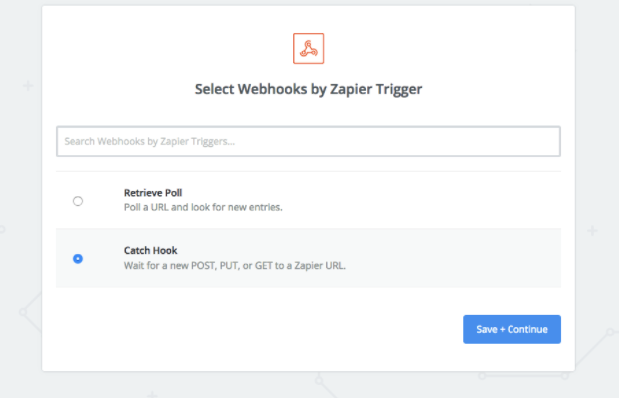 Find and select the “Webhooks by Zapier” trigger. Select “Catch Hook” and continue. Leave the next step empty (“Pick off a Child Key”). There’s nothing you need to set here. Just continue. Copy the webhook URL to clipboard. You will use this in a while. In a new tab, edit your Viral Loops campaign (or create one if you haven’t done so already) and in the Integrations step (not available in the Altruistic template) of the Campaign Wizard enable and edit the Webhook integration. In Endpoint paste the webhook URL you copied previously from Zapier. Now save the integration settings and continue editing your campaign. Back to Zapier now, click the “OK, I did this” button. 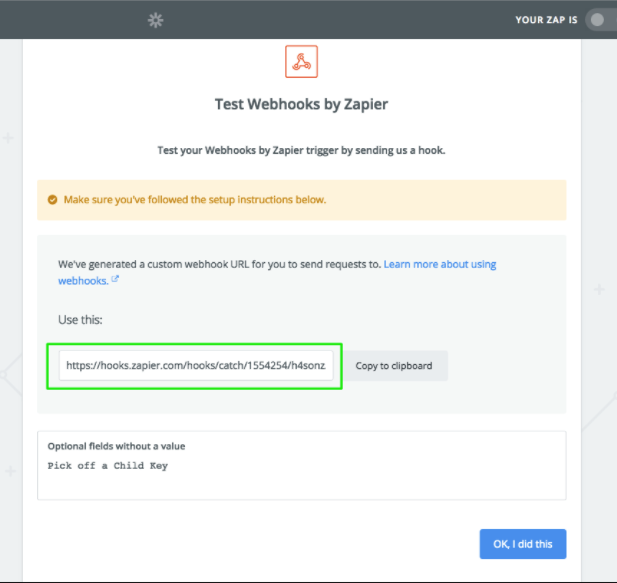 Zapier will now check to see if it has received any webhook on that webhook URL and it should detect the test request that you sent earlier from Viral Loops. Assuming the test is successful, click “Continue”. If something didn’t go as planned, make sure the webhook URL you got from Zapier matches the one you pasted in your Viral Loops integration setting. Now it’s time to tell Zapier what to do with the data received from the webhook. 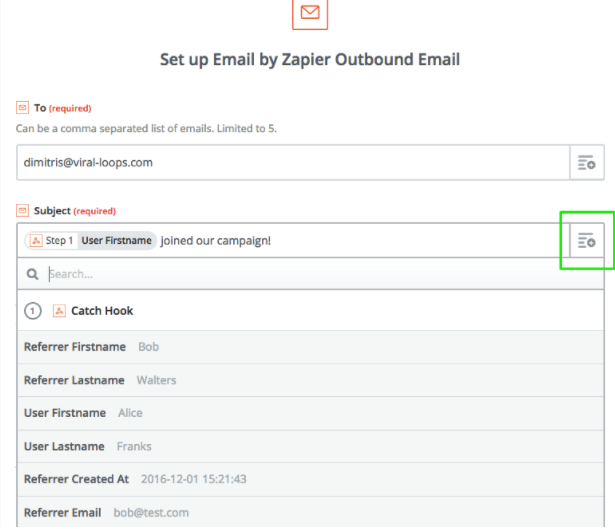 Select the “Email by Zapier” action. You can totally customise the email that will be getting sent and include in it participant details that were captured during the participation. "User" is the person who just joined your campaign, your new participant. "Referrer" is their referrer, if there was one. Referrer values are empty if the user joined without having been referred by someone. User Firstname: The first name of the user who just joined. User Lastname: The last name of the user who just joined. User Email: The email address of the user who just joined the campaign. User Referral Code: The referral code of the user who just joined the campaign. User Created At: The date on which the user joined the campaign. Referrer Firstname: The first name of the referrer of the user who just joined. Referrer Lastname: The last name of the referrer of the user who just joined. Referrer Email: The email address of the referrer. Referrer Referral Code: The referral code of the referrer. Referrer Created At: The date on which the referrer joined the campaign. Save and continue now. 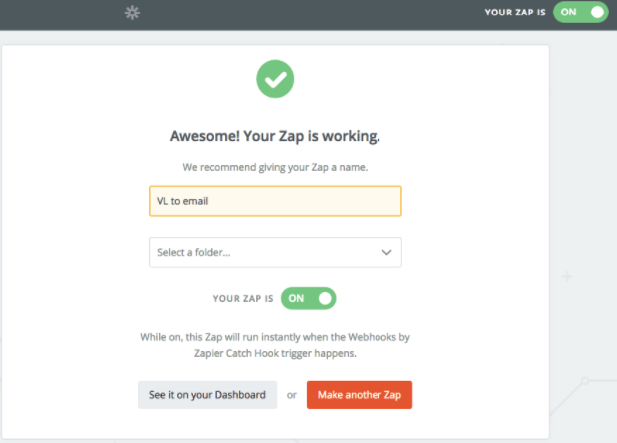 Zapier will send a test email to verify the Zap works and then you can just name your Zap and turn it on! That’s it! Now the moment someone joins your campaign, you will receive an email including their details. You can now go back and create another Zap with a different integration.